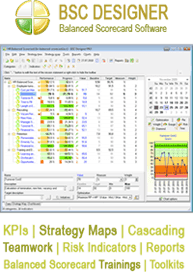 Download Business Analysis Method Toolkit. There are several different methods currently used in the business world and one of the most popular strategic evaluation tools is the SWOT analysis. SWOT stands for strengths, weaknesses, opportunities, and threats. Check also the full version of the toolkit. SWOT can be further classified in to internal and external factors. Strength and weaknesses belong to the internal factors, and the opportunities and strength are classified as external factors. We discuss several business cases where SWOT has been used and will provide you with a detailed information how it have been helpful in the decision making process. Finally, we will provide you with a detailed checklist and FAQ sections. By reviewing the information, professionals looking for the material on business analysis methods can get educated on the key aspects of SWOT. “SWOT Analysis” part addresses the definition of the SWOT analysis, and talks about the problems and situations that the method can be useful for. It is a short, but all inclusive summary of the method and its uses. 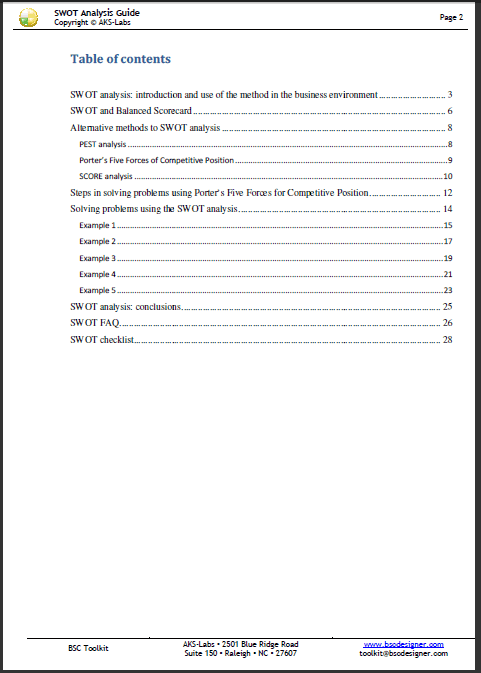 It provides reader with focused information on the advantages and disadvantages of the method, informs on the key stakeholders of the SWOT analysis, and provides information on who uses the method the most. 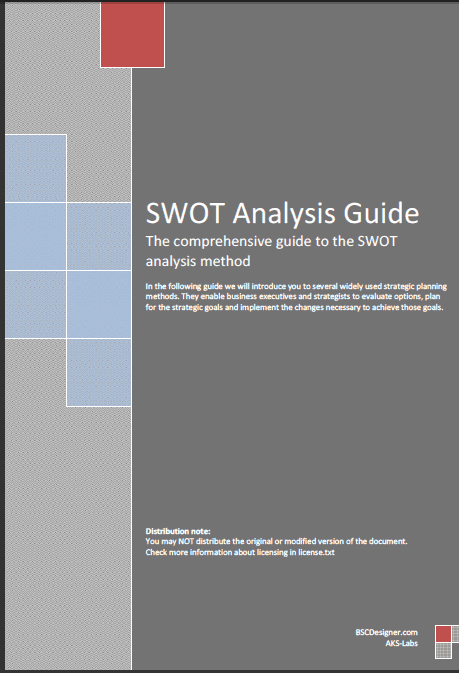 SWOT analysis: Introduction and use of the method in the business environment. “SWOT and balanced Scorecard” is a summary part that discusses the balanced scorecard as a tool for the business professionals, and provides a view of how SWOT and balanced scorecard can work together in order to achieve the strategic goals. 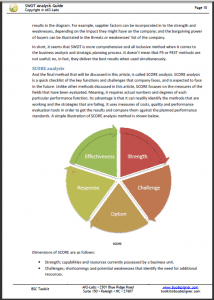 It concentrates on the role SWOT plays in the balanced scorecard. It answers a question of how SWOT can assist in designing the BSC (balanced scorecard) and what are some of the measures and evaluations necessary in order to achieve the best results. It compares the scope and coverage of each method and presents them as a complementary to one another. 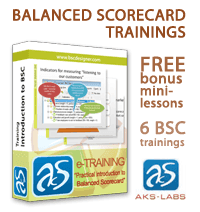 Learn more about: SWOT and Balanced Scorecard. Part “Alternative Methods to SWOT analysis” discusses some of the alternatives available today when it comes to the strategic planning tools and methods. It is a summary part that goes in to certain detail about three alternative methods: PEST, Porters Five Forces for Competitive Position, and SCORE. These are all methods that have been very popular through years and have earned positive evaluations from many prominent business professionals. As with all other methods, they have advantages and disadvantages that we will try to present as fairly as possible. Furthermore, we will discuss them in contrast with SWOT and try to give you an objective point of view on which is the best solution and in what case do they provide the best results. 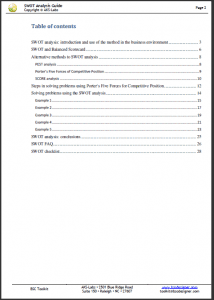 Part “Steps in Solving Problems Using Porter’s Five Forces” touches on one of the alternative methods to SWOT, and provides a step by step guide to what it means to solve the problem using Porter’s Five Forces. It is an all-inclusive and detailed part on the method, its applications and the advantages and disadvantages it offers in the decision making process. It goes in detail on every force described by the author and provides some examples and scenarios where the method might be useful. Part “Solving Problems Using the SWOT Analysis” talks about the method and its pattern of implementation in the business world. 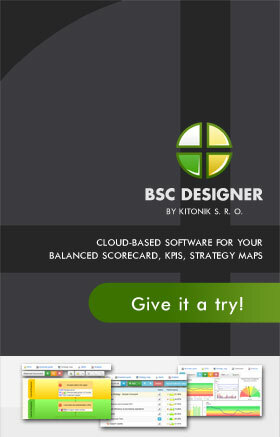 It provides 5 alternative scenarios where the method has been successfully used and has delivered the desired results. It is a sort of practical illustration of a theoretical concept. In this part we will try to show you how the real companies have used the method and what are the steps, factors and details that one needs to pay attention to when using SWOT. After reading this part, reader will have an idea about the method, the theory behind it, and how it can be helpful for the strategic planning purposes. Part “SWOT Analysis Conclusions” discusses and summarizes some of the key points made in the previous parts about the method. It offers more analytical rather than discussion tone, and provides readers with some prospective on the method, its advantages and disadvantages, and the opportunities other methods might offer. 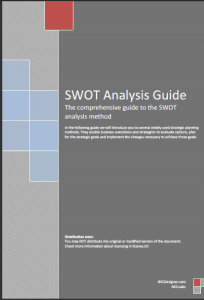 It mostly discusses the best scenarios when the SWOT delivers the highest results. Part “SWOT FAQ” talks about the method and the questions that some might have when first encountering it. Questions like, why use SWOT? Who are the key stakeholders, and what are the cases when the method is most effective? Also, one might be interested in who is the main user of the method is. All of these questions and more are addressed in the part. Part “SWOT Checklist” discusses some of the key aspects that one would need to use, in order to analyze the situation using the method. It give a user an idea about the factors that affect the method, about the key measures that need to be addressed and it touches on the results and their interpretation by the business professionals. It also addresses the topic of the key findings and most probable outcomes. In other words, it is a complete overview of the method and the factors that affect its results.